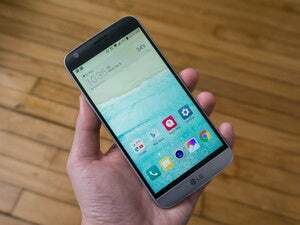 Google Keep is not preinstalled on all phones, which is a real bummer. It's one of the most focused and useful apps in Google's arsenal. On the surface it's a stylish basic note taking app, but dig deeper and it ties into several other Google services, making it easier to get things done. 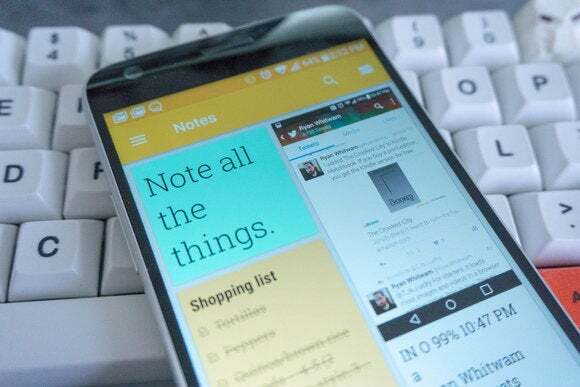 Here are five ways to unleash the amazing power of Google Keep. Add items to your shopping list without even touching the phone. Keep is great for making lists, for example a shopping list. 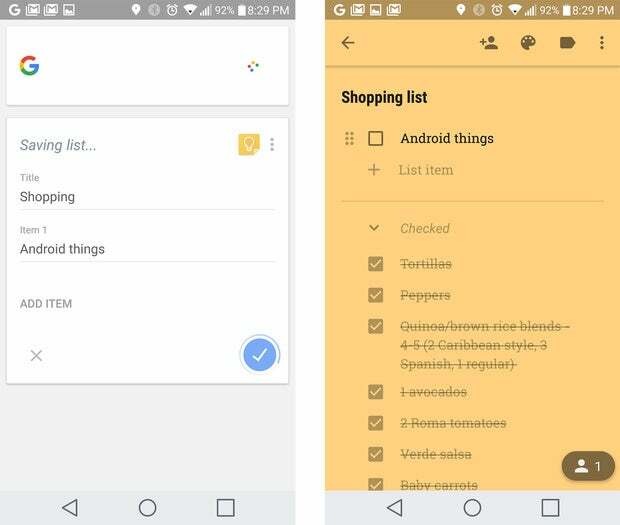 If you actually title one of your lists "shopping list," you can add new items to it without even opening the app. It's a simple matter of pulling up your Google voice search by tapping the mic in the search bar or using the "OK Google" hotword. Just say, "Add to my shopping list," and you'll get a cool Google Now card that lets you list items one after another. When you're done, say "finished" or "that's it" to have everything you've added inserted into your shopping list note. You can also add single items in a single step by saying, "Add [item] to my shopping list." It's a remarkably well-developed feature. 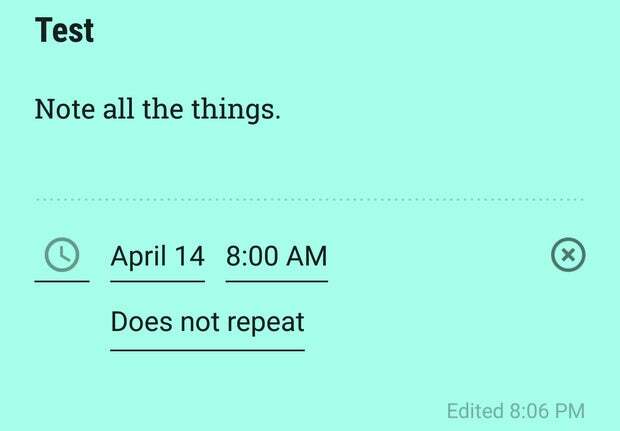 Reminders in your Keep notes show up in Google Now too. Down at the bottom of each note in Keep is a "Remind me" button. 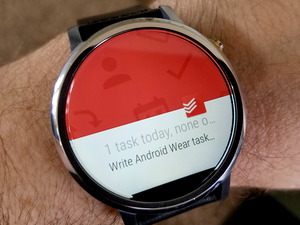 You might never have paid attention to it because you already have reminders on your phone via Google Now. However, this feature is actually tightly integrated with Google Now. When you tap the reminder button, you have the option of setting a time or location reminder. With the time, you just pick when you want a reminder notification pushed. For a location-based reminder, type in an address or the name of a location, and your device will remind you when you are nearby. All the reminders you set in Keep are accessible in Google Now—it's the same system. You have the added bonus of getting the note text right there in the reminder when you set it through Keep. Collaborate with shared Keep notes. Most apps use the same terminology and icons for sharing content on Android, but Keep is a bit different. It has both sharing and sending, and they mean different things. Sending is what you'd normally think of as sharing in other apps—taking the content from your note and pushing it to another app. That's in the overflow menu in Keep. 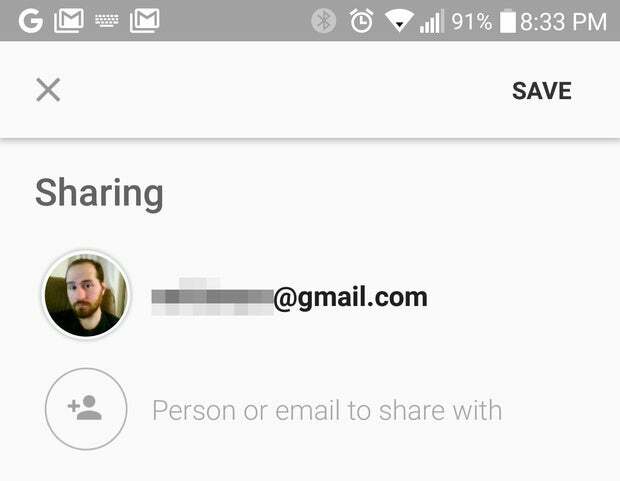 Sharing, on the other hand, refers to making one of your lists available to someone else in Google Keep. Sharing a list allows one of your contacts to read and edit a note. It's a great way to keep track of chores or a shopping list (don't forget the voice features). To share a list, tap the contact plus button at the top of the screen, then enter a contact's name or email address. They'll get a message asking them to accept the invitation to manage the note. You can open the sharing menu again at any time to remove someone from the note as well. Use OCR to make the text from a photo editable in Keep. Did you know images can be inserted into Keep notes? That's pretty straightforward, but what about extracting the text from those images? Keep can do that too, and it's a really useful feature. For example, you just snap a photo of someone's business card or a sign, then have keep turn it into editable text. The first step is getting an image in Keep. You can add a photo to a new note with the camera button at the bottom of the screen. Either snap a new image or import one you've already taken (these can be screenshots as well). For existing notes, the image option is in the overflow menu. Once you've got the pic in Keep, open the overflow menu and select "Grab image text." Google Keep runs optical character recognition on the image (which takes a couple seconds) and adds the text under the image. Move an entire Keep note to a new Google Doc for more advanced editing. 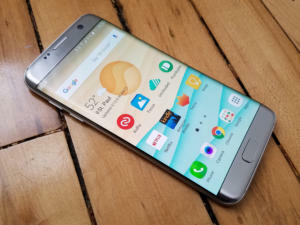 With all the widgets, voice commands, image imports, and so on, your Keep notes might start to get a little ungainly. If you want to use that text for something more intricate, Keep isn't the best environment. Luckily, you can get all the text in a note into a Google Drive document in one step. Open the note you want to transfer to Docs, and go into the overflow menu. At the bottom you'll see "Copy to Google Doc." 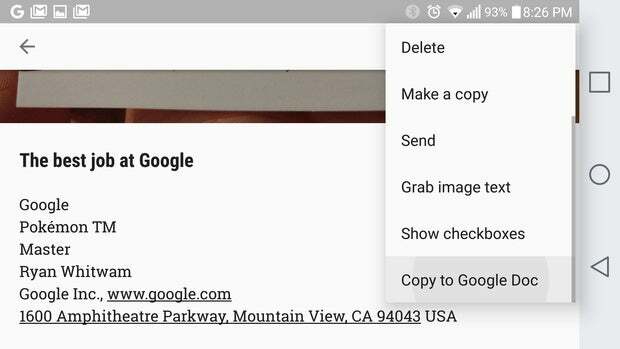 This option grabs all your text and images, then transfers them to a new Google Doc. 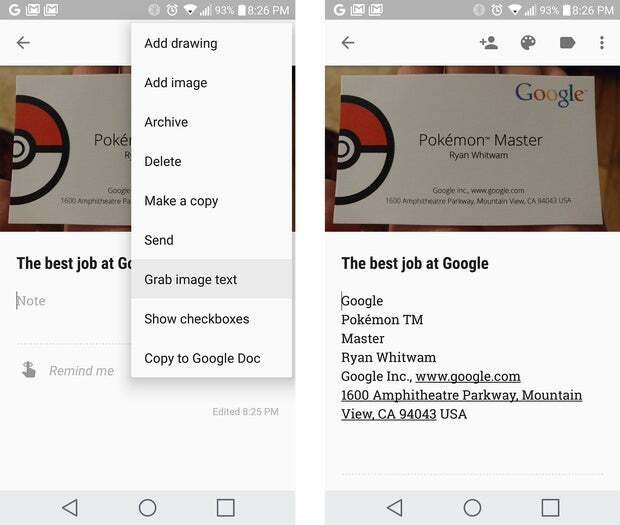 The original note is left untouched, and you can truly say you have mastered Google Keep.